After nearly two decades of construction, the world’s longest tunnel is now ready to carry cargo and passengers on a route that cuts right through the Swiss Alps. The 35-mile high-speed Gotthard base tunnel snatched the title of world’s longest and deepest tunnel upon its opening, and now connects northern and southern Europe. Swiss officials celebrate the high-speed rail as a major advancement for European transportation. 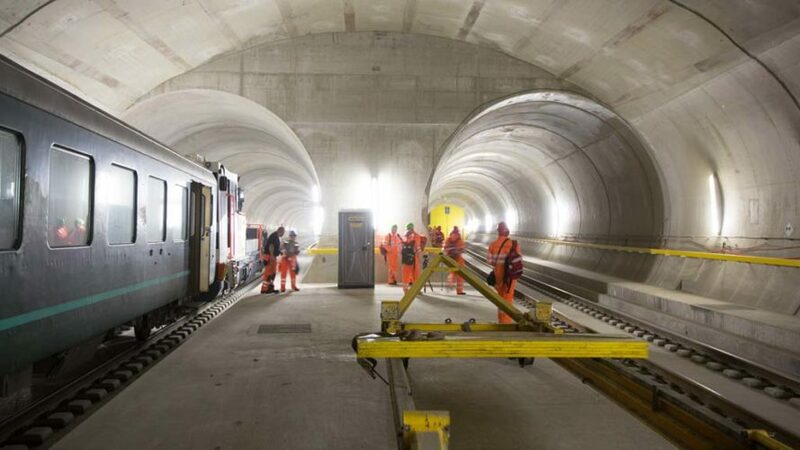 The new tunnel in Switzerland is actually two tunnels, each with a single line of tracks for high-speed trains, running side by side for the length of the route. Prior to today’s opening, the longest tunnel in the world was the 33.5-mile Seikan rail tunnel in Japan. The Gotthard base tunnel, at 35 miles long, edged out Seikan to take the top slot, and also wins the designation of being the deepest rail tunnel on Earth. At its deepest point, the rail line runs nearly 1.5 miles under the mountains. Just a year ago, the tunnel’s route was traveled by a million heavy cargo trucks, hauling goods across the continent. That inventory will now be transported by rail, hopefully saving time and energy costs. Although the new record-holding tunnel officially opens today, commercial rail schedules won’t begin until December. Rail officials celebrated the $10 billion tunnel’s completion with an inaugural run by two trains, one on each track, heading opposite directions. Aboard the trains were government and rail authorities, as well as members of the public who won tickets in a contest. Nine tunnel miners killed during the long construction period were also memorialized during the opening ceremony. The Gotthard base tunnel cuts a 35-mile path through the Swiss Alps, and is now complete after nearly two decades of construction. After nearly two decades of construction, the world's longest tunnel is now ready to carry cargo and passengers on a route that cuts right through the Swiss Alps. The 35-mile high-speed Gotthard base tunnel snatched the title of world’s longest and deepest tunnel upon its opening, and now connects northern and southern Europe. Swiss officials celebrate the high-speed rail as a major advancement for European transportation.